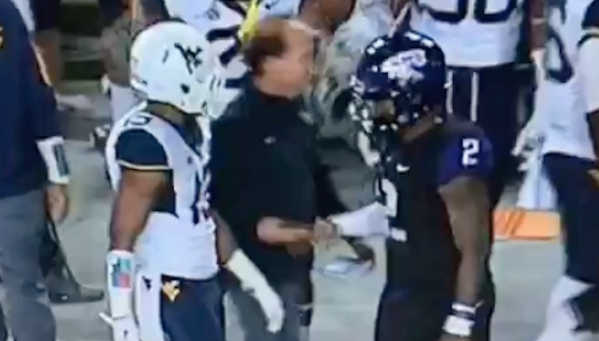 Dana Holgorsen is not a hater, so he knows when he’s witnessed something nasty on the field. TCU Heisman candidate Trevone Boykin was electric in the Horned Frogs' 40-10 victory over West Virginia in front of the home crowd. Boykin completed 32-of-47 passes for 388 yards, ran for 84 yards and totaled four touchdowns against the Mountaineer defense. Boykin was so electric on one particular run—making four different Mountaineer defenders look stupid—that the West Virginia coach had to show respect, giving Boykin a high-five. “He was literally standing right there, and he just started smiling,” Boykin said with a laugh. “I just put my hand up to give him a high-five, and he gave me one. Holgorsen offered his version of the events. Holgorsen added that the high-five stemmed from how much he has admired Boykin on and off the field over his entire career. Holgorsen later deemed Boykin the best player in the country.